How many graphic designers are there? According to The United States Department of Labor, there were 266,300 graphic designers in 2016. How many web developers are there? According to The United States Department of Labor, there were 162,900 web developers in 2016. What should I look for when hiring a website design company? More of the same old BS. Seemingly endless boilerplate lists of varying sizes—essentially callous interview scripts for you to copy and paste. Flaming hot garbage for you to blast out in a blind-copied email to a compiled spreadsheet labeled “best web design firms near me”. I get why people try to complicate and automate the process of screening and ultimately hiring a website design company. Trust me, I get it. Designing a website can be a big deal. Not all the time, but sometimes. Maybe you had a bad experience in the past with Freelancer Fran. Maybe there are impatient investors breathing down your neck that need a website up yesterday. Maybe you’re new to the world of entrepreneurship and you’re a little lost and hesitant to pull the trigger. Whatever your reason may be, I want you to put that behind you. Because there’s only one thing that you should be looking for. And it isn’t in the design or development portfolio. It isn’t in the proposal or scope of work either. It’s going to require you to pick up the phone and speak to someone. But in 15-30 minutes, you’ll know if they’re good, or no good. Look for a company that has good character. The #1 thing to look for when hiring a website design company is good character. This may or may not come as a surprise, but there are a lot of people out there that frankly don’t give a crap about you or your business. What they do care about is making a sale. And they’ll do whatever it takes to make that happen. That includes showing you examples of beautiful web sites from your competitors, writing case studies that show meaningless results from past web designs, giving you all of the answers that you want to hear instead of what you need to hear. Let’s re-emphasize that last point. Look for a website design company that won’t simply give you the answers that you WANT to hear. Find, hire and hold onto a website design company that will give you the answers that you NEED to hear. That’s a rare and valuable asset. Before, during, and after the website design process you need a constant dose of reality. Yes, you need someone that will hold your hand, but you also need someone that isn’t going to just stroke your ego, bake you a tray of chocolate-chip cookies, and serve as your creative “Yes Man”. How can you tell they’re genuinely good? I have no doubt that you’ll see thousands of really awesome web designs. I have no doubt you’ll dive into countless different design processes, strategies, and pricing models. And many of those companies are 100% good at what they do: designing and developing websites. But that doesn’t mean that they are necessarily good for you. When you start looking for a website design company, everything outside of character is clutter. Services provided, corporate policies, and final delivered product are all important aspects that do deserve consideration down the line—but they are not the #1 thing to initially look for. Here’s the problem: as you add more things to your “perfect agency ” requirement checklist, the less perfect any one website design company will be. This is a fact. We’re not all perfect. You’ll drive yourself nuts looking for someone that is (this goes for anyone in any industry). One company might have a great published portfolio, while another might have content that resonates with your vision. A third company might have really simple pricing that seems like a steal. The options — and your stress — will keep compounding until you go crazy or broke trying to find your business’ silver bullet. First focus on finding out if the people behind the scenes are genuinely good. Do they sincerely care? Do they provide a team of people you could see yourself actually working with to produce something great? Is this company willing to make calculated sacrifices for me? Will they put all opinions (except for my market) aside? Do they have the guts to tell me no? Can I relate to them on more than one level? When it comes to sacrifices, we’re not talking about a ceremonial beheading of a cow to summon the Gods for a smooth build, successful launch, and sales out the wazoo. Sacrifices can be as small as meeting halfway for an introductory meeting, to as big as providing a reduced hourly rate built around equity options. Your website design company is supposed to be a strategic partner that you can rely on. As with all partnerships, there will be times where faith and commitment will undergo trials and tribulations. So, prior to making a decision, you should know where your prospective vendor’s priorities truly lie. If your ship starts sinking, are they going to be the first people grabbing for life-jackets and a seat on the inflatable raft? Or are they grabbing the rusty pail and bailing out the water? While it should be implied, it’s still worth noting: sacrificial gestures go both ways and should be evenly displaced. Don’t mistake kindness for weakness. And don’t take advantage of someone else’s commitment. They have the right to cut you off with any scissors you hand them. Here’s a shocker: your opinion doesn’t matter. Not when it comes to your logo, or your web design, or your content, or your marketing strategy. I repeat: your opinion doesn’t matter. And neither does the opinion of your web designer or web developer. The only opinion that matters is the opinion of your target audience. There are a lot of web design companies that market their services based on their own inflated estimation of themselves and under the assumption that they, and they alone, know what’s best for their clients. 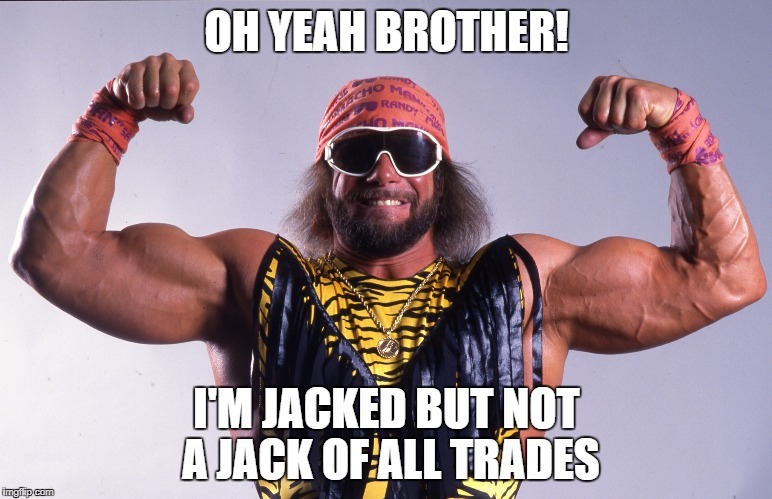 Macho Man Randy Savage is not your web designer. You can appreciate a company with confidence, but unless they prove themselves to be your central demographic and primary acquisition, make sure you take it with a grain of salt. And don’t toot your own horn too much. You may consider yourself an expert in your industry, and you very likely are, but are you selling to a mass of your own personal clones? The market will yield what the market should yield. The customer is always right, except when they’re wrong. Your search for a website design company began with an idea. It’s important to know that there are no bad ideas, but there are bad decisions. Even the most well-established, successful businesses make mistakes. Competition is overlooked. Opportunity is mistaken for threat. Focus is fixated on waste. This happens every day to even the most brilliant of business minds. A website is first and foremost an investment. Let’s not get it twisted people. Is developing your website money well spent? The answer could very well be yes. But it could also be no depending on a wide array of circumstances. If you are not prepared, or well-equipped to succeed in your endeavors, it’s only ethical for a web design company to turn you down. Think of it this way: you want to buy a beautiful house on a cliff overlooking the sea. The realtor sends out an engineer to inspect the property. They find that the structure supporting the home is eroding. Would you expect them to still sell you the home? As a client, understand that you can get shut down, and it’s definitely not taboo when it’s in both parties best interest. Beyond a company having something that you want (web design services) is there any other reason why you’d choose them? This is an important question to ponder prior to making a decision because there are going to be a lot of companies that can fulfill your work order request. Design styles today are rarely unique or unmistakable. It’s really all about trends. And trends can be easily mimicked. Thimothy goes on to discuss some of the benefits that result from connecting with like-minded entrepreneurs, which includes drawing inspiration from their passion. This is hugely important. And connecting with like-minded individuals isn’t just for entrepreneurs. A study published in the Journal of Vocational Behavior suggests that how people feel about their co-workers positively impacts their work and life. While the website design company you contract isn’t technically your “co-worker”, it’s crucial that they feel like one, especially since you’ll be working so closely together. Finding common ground—even with small things like music taste and sports affiliations—are what separates a good working relationship from a great one. You are awesome, so why would you settle for anything less than equal to you? Put the extra time into getting to know the guys and gals behind the code. My goal in writing this post was to hopefully simplify the initial process of searching for a website design company. After some research, I noticed that there are a ton of generic things other blogs and websites suggest. Unfortunately, generic questions provide generic responses. At Orpical Group, we pride ourselves on being a little unorthodox. We like real conversations with real people. We don’t take on every web design or development project that comes our way, but we do take every first conversation. Whether it’s a phone call, an in-person meeting, or video conference call on Skype, we’re anxious to hear about you and your vision for your website. To schedule a free 15-30 minute consultation, please contact us. Following our discussion, we’ll have a good idea if we are a good fit to work on your project. And if we believe that we are a good fit, we’ll provide a detailed proposal and scope of work.